Tuesday July 3rd 1923 Home all day, did some sewing. Wrote Hattie and Nellie. The folks spent Sunday night in South Band. A very hard rain late in afternoon. Cora at store all day. Wednesday July 4th 1923 Laura and I were ready by noon to go to The Park to a picnic with the relatives. Rob & Cora took us there but did not stay. A great visit and fine dinner. Home by street car and Taxi. Will & Corrie Anderson here in evening. Rob & Cora home early. 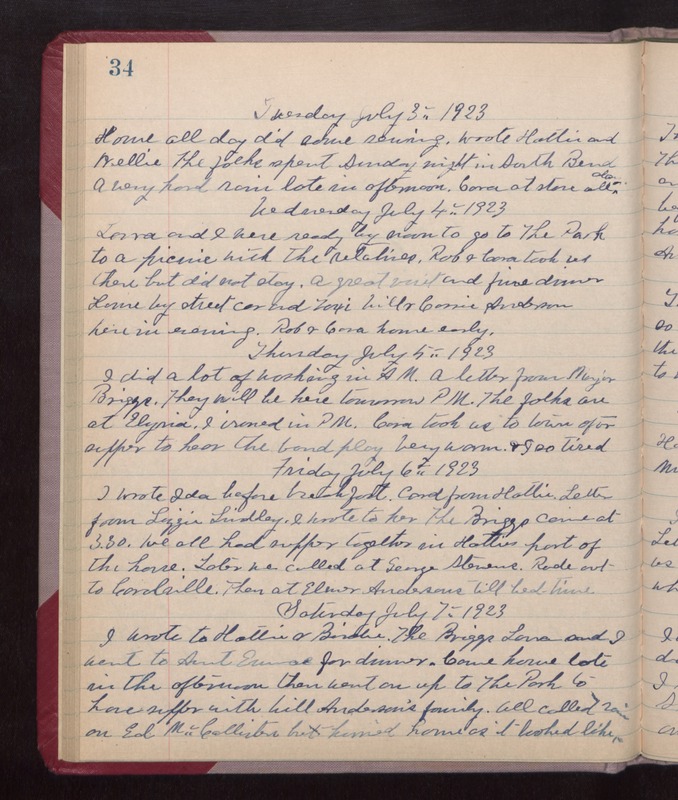 Thursday July 5th 1923 I did a lot of washing in AM. A letter from Major Briggs. They will be here tomorrow PM. The folks are at Elyria. I ironed in PM. Cora took us to town after supper to hear the band play. Very warm & I so tired. Friday July 6th 1923 I wrote Ida before breakfast. Card from Hattie. Letter from Lizzie Lindley. I wrote to her. The Briggs came at 3.30. We all had supper together in Hatties part of the house. Later we called at George Stevens. Rode out to Coralville. Then at Elmer Anderson till bed-time. Saturday July 7th 1923 I wrote to Hattie & Birdie. The Briggs, Laura and I went to Aunt Emmas for dinner. Come home late in the afternoon then went on up to The Park to have supper with Will Andersons family. All called on Ed McCallister but hurried home as it looked like rain.